The outrage over the “Impeach 45” t-shirts and other clothing sparked a campaign on social media with a hashtag of #BoycottWalmart, Fox News reported. 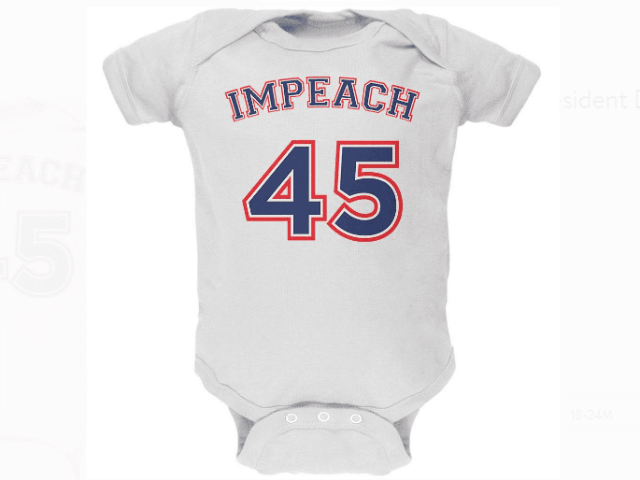 Conservative activist Ryan Fournier was one of those who first discovered the anti-Trump Walmart clothing line when he saw the “Impeach 45” baby jumper on the Walmart website. The clothing line that earned Fournier’s ire is produced by the Old Glory company, but that is just one of several companies selling anti-Trump merchandise on Walmart’s website. A search of the Walmart website shows a number of products advocating for Donald Trump’s impeachment. Like many companies, on its website, Walmart offers the merchandise from a variety of vendors that it does not necessarily stock in its brick and mortar retail outlets. But that propensity has gotten the company in trouble with customers in the past. In December of last year, for instance, many were alarmed that Walmart was selling gear designed to appeal to the violent, socialist Antifa movement. Then, in 2015, the company apologized for allowing its bakery to make a cake featuring the ISIS flag.